Is Comet Safe for Septic System Tanks? Yes and No. Ever since we wrote about getting our septic system tank installed, some of the most common questions we get now from our readers are about whether certain bathroom cleaning supplies are septic-safe or not. So we came up with a short list of recommended toilet bowl cleaners for homes with septic systems but since then we’ve been asked similar questions about specific brand-name cleaning products. One of the most common product brands that people ask about is Comet. I guess it’s a popular cleaning supply! Is Comet Safe For Septic Systems? Our answer used to be a resounding “NO”, I explain below why we’ve changed our tune slightly (and a new product introduced by the same company). Comet was actually listed on the 2012 Environmental Working Group’s Hall of Shame (opens pdf). The EWG’s 2009 study found that Comet had over 100 hidden chemicals that were not listed on the ingredients label. Some of these substances including formaldehyde, benzene, chloroform and toluene are thought to cause cancer, asthma and reproductive disorders. The powder emitted a total of 146 different chemicals! I don’t know about you but that seems like a bit of overkill – is all that junk really necessary to clean your home? Apart from you or the person doing the cleaning in the house (and breathing in a small amount of it while they scrub away), there are kids, pets and loved ones to think of also. Traditional Comet contains trichloro-s-triazinetrione among the other 100+ chemicals we mentioned above. While using small amounts of these chemicals might not kill off all the healthy bacteria in your septic tank, it’s one of the ingredients you want to avoid. Another major concern is that if Trichlor comes in contact with calcium hypochlorite or bleach it can cause a violent reaction. We avoid using bleach in the house in general but this is another good reason to avoid using it and the possible problems it could cause if the two ended up mixing in your drain or tank. 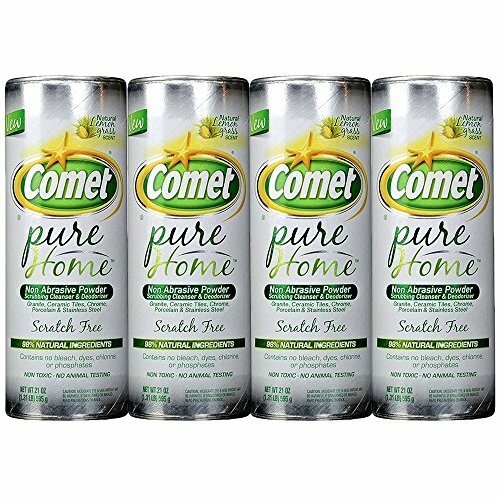 Comet “Pure Home” Natural Cleaner (click to see on Amazon). While we were researching, we discovered that Comet now has a Comet Pure Home’ natural option that doesn’t contain bleach and contains 98% natural ingredients (according to the label). So if you’re used to the traditional Comet in the familiar solid green container can and you like the way it cleans, you may want to try this new “pure home” version if you are living on a septic system and trying to maintain a healthy tank (and toxic free home). If you are looking for a more mild, natural cleaner, that is safe for your septic & has a much shorter list of chemicals, we like this Bon Ami Polishing Cleanser Powder. It’s a cleaning powder similar to Comet but does not contain chlorine, perfume, or dyes. However, it is still strong enough to clean up greasy and sticky messes. It also has the same scratch-free qualities of Comet -so as far as we see, there really isn’t anything missing out (except maybe a lot of the chemicals). Another safe option is this Eco Nuts All Scouring Powder. This cleaner uses plant-based ingredients and botanical extracts and is made with USDA Certified Organic ingredients. It’s also Phosphate-Free and Fragrance-Free. An added bonus is that it comes in a brown paper bag, so no plastic used and it could be composted along with coffee grounds and other household items. If you really don’t want to use any store-bought chemical cleaning powder and you are more of a DIY person you could try out this recipe. It’s easy to forget that not that long ago people kept their homes clean without buying strong store-bought chemicals. My dad grew up on a dairy farm and my grandmother still made all of her own soap and cleaning supplies with simple things she bought at the “general store” and mixed together at home. *This is optional if you want a “clean” smelling scent. We like these natural oils by “Healing Solutions” Lemon or lavender work well for cleaning and leaving a fresh smell. If you want to turn the mason jar into a shaker, carefully poke holes in the top. For a simple solution, pizza cheese shakers work well. We were looking for one with a lid and found this one, it’s stainless steel and has a rotating lid which is an easy way to keep it closed and prevent spills. *For really bad messes, pre-treat area with white vinegar. Comet is not the best option for septic. If you are living in a home with septic tank, you may also be interested in this DIY septic tank activator and these recommended septic-safe laundry detergents. *Comet is manufactured by Prestige Brands Holdings, Inc., a company based in Tarrytown, NY was established in 1999. Comet was launched as an all-purpose cleanser cleaner and deodorizer for many different surfaces including porcelain, stainless steel, fiberglass and ceramic tile. The main selling point is that it scrubs things clean without scratching surfaces. Suction Cup Handheld Shower Head Holders | Do they really hold?